This is what happens when you plant some lavender in your garden, just look at all the activity! 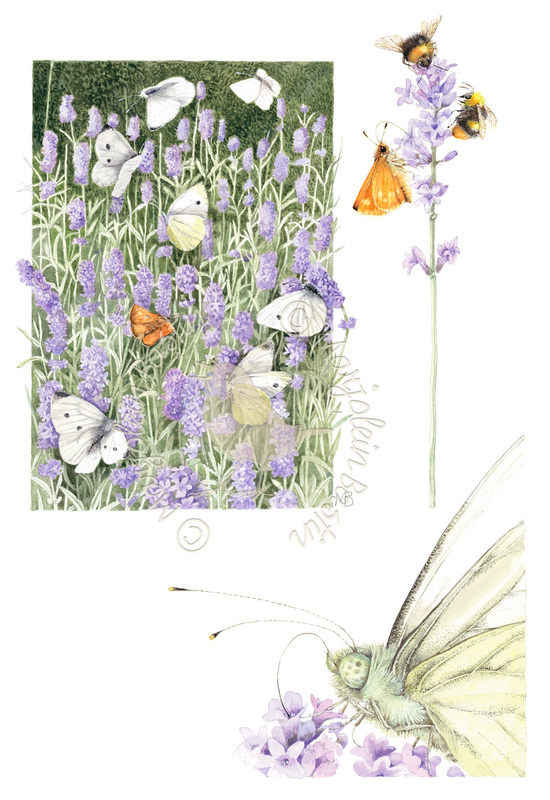 It is warm in the garden and a sweet aroma greets me, the lavender is fully in bloom and I watch as dozens of Small Whites are darting around. It is really a beautiful sight, especially against the dark background of the yew hedge behind it. When I look a little closer I notice there are Green-veined Whites as well as Small Whites as well as a variety of skipper butterflies, bees, bumblebees and hoverflies. There are so many ways to make your garden attractive for butterflies. So many nectar plants! Of course, everybody knows the most famous one: the Buddleja or butterfly bush. Some beautiful perennials for the garden –and for the butterflies- are Showy stonecrop (Sedum spectabile), Field Scabious, Hemp-agrimony, Wallflower, Verbena, Damask Violet, New York Aster, and of course Oregano which in Dutch is called “Wilde Marjolein!” Apart from being medicinal and a great herb for the kitchen it is also known for attracting many butterflies! !